The adobe structure that houses La Posada del Valle ("The Inn of the Valley") was designed by a celebrated Swiss architect, Josias Joesler, who was know for his combination of Spanish Colonial-Territorial style structures in the Tucson area.. 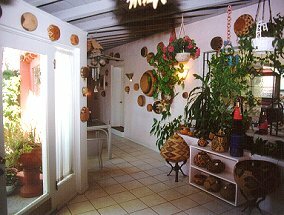 The uses of arches, breezeways and patios represent the outdoor lifestyle so enjoyed in Tucson, and an unassuming pink-walled exterior disguises relaxing patios and lush gardens shaded by citrus trees and bursting with the colors of bougainvillea, pansies, and bulbs. The courtyard is the ideal spot for unwinding and enjoying the relaxed pace and our sunny climate. La Posada remains a gracious example of Joesler's early Sante Fe design when it was built as a private residence on the outskirts of the city and surrounded by desert. 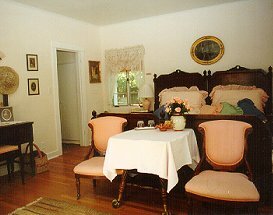 Today, La Posada, which opened in 1986, lays claim to being Tucson's first bed & breakfast. Located across the street is the University of Arizona Medical center and the north section of the University campus it is central to the extended business and manufacturing offices and plants, and the University of Arizona as well as the unending attractions offered by Tucson, the surrounding areas and nearby Mexico. 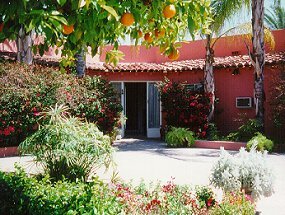 The guests at La Posada are offered the options of two sizable suites and three spacious rooms, each with its private bath and outside entrance. The rooms are named after famous women of the 1920's and 1930's. Sophie's Room, named for stage star Sohpie Tucker, features an 1818 king-sized bed smothered with fluffy eyelet-trimmed pillows, a chaise lounge, an antique dressing table, and a feather boa draped over a mirror. Other rooms honor Isadora Duncan, Pola Negri, and Claudette Colbert. Each room has its own distinctive approach to combining personal intimacy with the surrounding gardens and the sense of a relaxed pace.